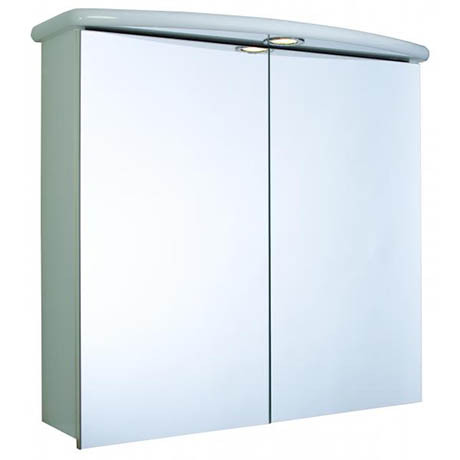 The Thames cabinet is a Double door wall hung bathroom unit that provides excellent storage capacity concealed by mirrored doors with overhead light. The cabinet has 1 internal fixed shelf for storage of toiletries/medicines etc. The Thames has an over hanging lighting to improve conditions for shaving/applying make up and other tasks. The cabinet comes complete with an integrated socket suitable for electric razors, toothbrush or other low power devices. Suitable for use in the 'outside' zone (IEE Regulation). Includes 1 x 12v SELV G4 halogen downlighter. Integrated shaver socket, suitable for electric razors, toothbrushes and similar low power devices. IP24 rated, suitable for use in the outside zone (IEE wiring regulations 17th Edition). Cabinet depth excluding overhang is 155mm. Looks good and the dimensions were accurate. Easy to fit and reasonable price.